Location: Lower Mainland BC I'll start. My 56 Custom Royal is mostly blues. The cowl build tag suggested the trim code ("TR") was "541". Previously I had removed the driver's door panel (like the one below but with damage at the bottom) and found "541" stamped in yellow on the back of the door card. Here is another 56 Custom Royal with the same colour combo. I presume that it would be a "541" car as well. As a result, I am pretty confident that "541" is the blue interior option for a 56 Custom Royal, at least a four door. I know there was a two tone green, probably 540 or 543 ?? Okay, just when I thought I might start to figure this stuff out logically, the Golden Lancer in Oklahoma City shows up with a Chrysler historical letter that says that its 2dr Lancer black and white interior has a trim code of 545. (I thought the "4" was going to be reserved for four door cars. Not so, apparently. And then there is this Green trim. I have no idea what code it is. Help? Location: Buena Park, CA Mine is a 545 (Custom Royal 2 door hardtop with White and Black interior). But regretfully, the prior owner re-did the interior in the original style but not in the proper fabric. DepsilonD - 2017-12-07 11:50 AM Mine is a 545 (Custom Royal 2 door hardtop with White and Black interior). But regretfully, the prior owner re-did the interior in the original style but not in the proper fabric. Thanks Dave. I also contacted Dave Homstad who has a 56 Custom Royal 2dr Lancer (white, black and red) with the Black and White interior. He confirms the 545 code and sent some photos, two of which I have added below. Looks like the seat bottoms were the same for sedans and the 2drs (and maybe the 4dr hardtops) but the seat backs are different both front and back. "I think there were blue, green, and black/white for each interior/car variation (am i forgetting a color?). So a CR with a split front seat will have a different code than a 4-door. I’m thinking there would be 6 codes (if I am not forgetting a color) for CRL’s, 6 for Royals, 6 for Coronets, 6 for Custom Sierras, 6 for Sierras, and maybe one for a real Golden Lancers. (These are just thinking aloud, I’m not sure that the 2 door wagon was offered as both a Sierra and Custom Sierra, etc.) Here is the code for a Custom Sierra Wagon with a green interior= 833. 1956 La Femme = 546." "Ouch. That just made my head hurt. Yes, I think there are at least three colour themes (greens, blues and black and white) for sure. But there might be a fourth (red and white) Then for the cars there are Coronets, Royal and Custom Royals and at least four/five body styles (2dr sedans, 4dr sedans, 2dr hardtops, 4 dr hardtops and the convertibles) for each trim level. So maybe 3 x 3 x 4 = 36 codes. And *then* there the wagons and the Golden Lancer(s). Ouuch. Who has a dealer code book for 1956 Dodges? I will never figure this out on my own." I had actually forgotten that I had a copy of that tag. The advert for the green CRL is still there and the seller responded to my code questions: "underhood tag reads 11 11 07 045 body 836----paint 265----trim 543 terry in okc"
Location: Lower Mainland BC I wish that I could see the interior in this brochure "photo" better, to compare to the Hemmings Coronet D500 . I did find a photo of a 56 Custom Sierra wagon with the same cloth pattern interior which makes me wonder again about a Coronet with these "extras"
Here are the descriptions of the interiors from the 1956 Dodge Data book. I might have lost count but counting the bullets, I got to 45 different interiors including the wagons and the club coupes but NOT INCLUDING the Golden Lancers. (!!) If you have a code and can match it to a bullet description, please post it up. Location: Buena Park, CA I really need to get a copy. Thanks for sharing Dave F.
After I posted, I noticed that descriptions of the Coronet interiors only have 2 bullets *BUT* even the first bullet covers at least 3 different interior colours, etc. The second Coronet bullet looks like it covers an infinite number (my brain broke thinking about it). So WAAAYYY more than 45 different interiors. Reality, with the pattern described by the owner of this Royal as "flying ducks"
Location: Lower Mainland BC I bought a Canadian Dodge and Desoto trim and paint selection dealer book thinking that there would be fabric cross-overs somewhere between the US models and the Canadian models. That seems to be true for the Custom Royals but not for the Crusaders or Regents. The Mayfair fabric seems familiar - maybe a Plymouth?? Location: Newark, Texas (Fort Worth) Awesome pictures! Except this one (below) must have been a three-seater because the 2nd seat has folding bit to allow access to the third seat. Location: Lower Mainland BC Whenever possible, I am going to try this: Putting a photo of the car with a photo of the build tag with a photo of the interior. The CRL 2dr hardtop would be the 545 Trim Code (same as Dave H's and others). I am not sure what either the green trim code is or the red Royal Trim code. Found this today (56 Dodge Custom Royal Lancer) that sold at Barrett Jackson. I would speculate that the blue/white/silver trim code for this white/blue/blue CRL 2dr would be 544 based on the black/white/silver pattern of 542 + 3 = 545 so 541 + 3 =544. That would also imply that the 4dr version of the 543 CRL green trim would be 540 = 543-3. Maybe eventually I will be able to confirm such speculations. Okay. I guess I need to review my threads more because I just saw that I posted a Coronet 2 dr hardtop (816) with a 528 (white and black interior trim code). 0 to 9 as the third number = specific trim codes that reflect colour and pattern (that one still needs work). I reviewing some of the D500 info that people have sent me I found a IBM card from a 56 Coronet 4 dr sedan (815) with a 528 trim code (sound familiar)? Also and maybe more important, the same file has a card for a black, white and blue (Paint code 362), Custom Royal two door Lancer hardtop (body code 836) with a....drum roll *544* trim code, i.e. the blue version of the 545 black and white 2 dr Lancer. Now, I just need to find a 4dr Custom Royal with a green interior to confirm my speculation that the trim code is, (I hope), 540. Location: Lower Mainland BC While looking through my archives I found the 56 Coronet D500 (maybe) that was for sale as a former police car (with a PowerFlite?). Anyway, I found that I had a good image of it's May 8th, 1956 cowl tag so I put together this collage. It confirms the 812 = V8 Coronet 2dr sedan and 528 = sedan, Coronet, lines pattern codes. 01 Paint = all black and yup it is. 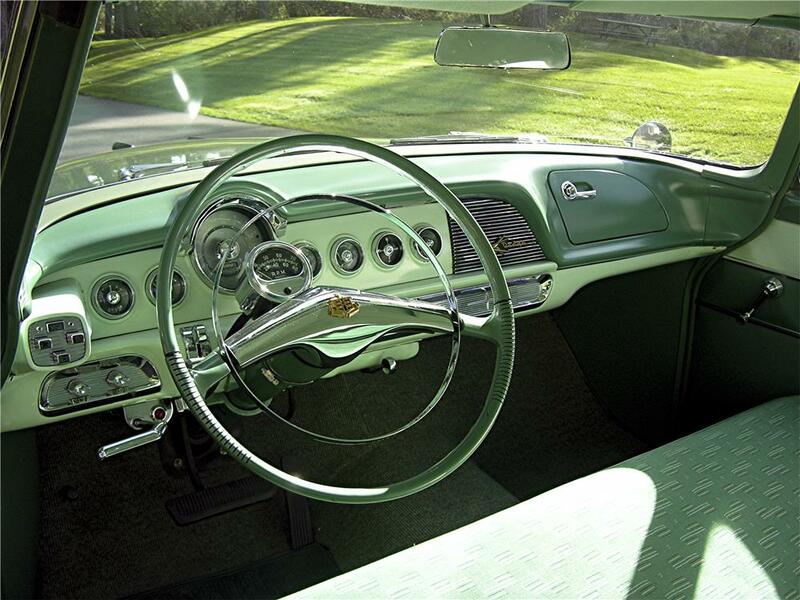 Just noticed an error when they redid the interior on this coupe (compared to other Coronets). Bonus for those who notice what it is. Location: Lower Mainland BC That was fun so I did another one using the 56 Custom Royal D500 sedan that was for sale in the Santa Barbara or Solvang CA area a year or so ago. Since then, I found a black, blue and white 56 Custom Royal Lancer with a 544 interior, i.e. the blue/white/silver version of the 545 black/white/silver, as confirmed by its cowl tag and IBM card. As of today, thanks very much to Gasmanscotty and his 56 La Femme 2 dr hardtop, we now know that the 56 La Femme interior trim code was 546 (see below). Location: Lower Mainland BC Found these photos on Facelessbook. Man I would like to see the cowl tag/IBM card on this one. I'm not sure if the interior is real or restomod. The pattern looks familiar but only in wagons. Never in this blue though (that I have seen). Nevertheless, a beautiful car.